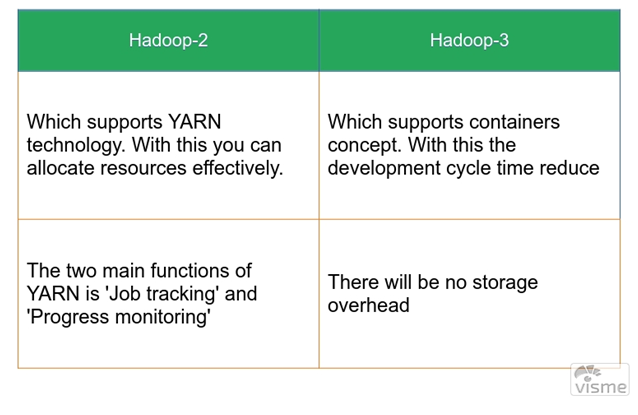 In many interviews, the first question for Hadoop developers is what are the differences between Hadoop 2 and 3. You already know that Hadoop upgraded from version1. The below list is useful to know the differences. I have given Hadoop details in the form of questions and answers so that beginners can understand. The major change in hadoop 3 is no storage overhead. So, you may be curious about how Hadoop 3 is managing storage. My plan is for you is first to go through the list of differences and check the references section, to learn more about Hadoop storage management.